Sharps is the latest book by K. J. Parker, who has written a great number of fantasy books including the Engineer trilogy and The Folding Knife. This is a stand alone book so you can read it even if you have never read a book by K. J. Parker before. Since Sharps is a book with some mystery surrounding it that is best read without knowing too much about the plot, I’m going to keep this one short. As can be gleaned from the title and cover, it is a book in which sword-fighting plays an important role. Four men and one woman from Scheria are either blackmailed or bought into joining a fencing team that travels to Permia, a neighboring country. Permia and Scheria haven’t always been on the best of terms, but the Scherians would like to make an effort to endear themselves to the people. Can these five survive without causing a diplomatic incident? When it comes to reviewing a book, I quite often mentally argue with myself between two things – how much I feel I should have liked it and how much I actually liked it. Sometimes there is a part of me that thinks a book is wonderful yet I don’t quite connect with it. Other times I enjoy a book immensely yet feel like maybe I shouldn’t have liked it as much as I did. At times, I reread a book when reviewing and change my mind completely about my initial impressions. Sharps is one of those books I’m having trouble reviewing for those reasons. While I was reading it, I was carried along by the witty dialogue and writing, although toward the end I did find my enthusiasm waning a bit from where it once was. There are some intelligent, sharp observations in this book that I really appreciated and enjoyed reading. Yet, after reflecting on it and rereading a bit of it, I’m finding I think it relied too much on dialogue and observation and did not spend enough time on plot or characterization to be truly phenomenal. 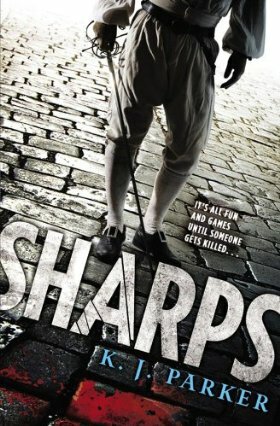 What impressed me the most about Sharps was the intelligent writing, conversations, and dialogue that are touched by a rather dark sense of humor. The way it was written at times made me laugh, and I found some of the situations characters got themselves into and how these scenes were written quite entertaining. There were some great themes about history and some of the statements that came up about human nature throughout the story were quite interesting. Parker has a definite gift for writing darkly humorous scenes and conversations that keeps this book very readable. Another aspect of Sharps I enjoyed was the world, which is pseudo-historical. It’s certainly a made-up setting, but there are no fantastical elements to be seen making it almost seem more like historical fiction even though it is not. I love reading about magic, but sometimes it is nice to take a break from it and get lost in a world with its own unique cultures that still seems familiar in a lot of ways. Although it has its own cultures, religions, food, and arts that flesh it out as a place separate from earth, there’s no exposition necessary to understand the basics of how the world works. It has its own cultural differences and political clashes, but they’re pretty straightforward. The world has its own unique aspects without seeming completely unfamiliar and alien. Sometimes it’s a nice change of pace to read fantasy where magic isn’t a means of power and characters have to survive based on their wits and abilities just like everyone else. When it comes to the plot, I have very mixed feelings. On the one hand, it did keep me interested for the most part and it had a sort of mystery that made me curious about the outcome. On the other hand, there were quite a few times when I felt like not much had actually happened considering the number of pages I’d read. For awhile, the dialogue and writing were enough to make me look past this, but there were times when I wanted more to actually happen. There is a lot of traveling and talking with a few fencing matches here and there, and there were some interesting developments toward the end, although I did find the answer to which person was involved rather predictable, even if not the overall result. While I often enjoy books that have a lot of dialogue and conversations between characters, I do want to see it contributing to plot advancement or fleshing out the characters. In this particular case, I ended up feeling like the characters had more style over substance. They said things that sounded good and served as sharp-witted foils for each other, but they seemed more like conduits for the dialogue than real, three-dimensional people with distinct personalities. The characters seemed to exist to serve the story instead of being a natural part of it. That’s not to say I minded the darkness or the ruthlessness of many of the characters; I just would have preferred to know more about them as people than I did. It’s obvious it had to be this way to an extent for this book to work, given that there was a bit of a mystery involving one of the main characters and each had his or her own perspective. Yet there wasn’t quite enough of a human element for me personally with this distance. In addition, there were a lot of character perspectives and a few of the transitions felt clunky. Some of that may be due in part to the fact that I did not read a finished copy since there was one spot where it really suddenly changed perspectives two paragraphs down in the same section. However, there were a lot of somewhat short sections dedicated to one character before switching to another. While I enjoyed getting the different perspectives, I also thought it switched too quickly between them at times and this could get tedious. From all this, it probably sounds like I didn’t like Sharps, but it’s really more of a case of it didn’t amaze me or live up to my expectations. Considering I really enjoyed K. J. Parker’s The Folding Knife, I had high hopes for this one. However, it’s been a couple of weeks since I read Sharps now and what I’ve found is that it’s less memorable than I originally thought when I read it. While it was an entertaining story with some fantastic dialogue and humor, the story or characterization that would have set it apart as something special for me were buried under all the cleverness. Where I got my reading copy: Galley from the publisher.